One of many people’s least favorite aspects of spring (especially the allergy sufferers) is the pollen. Every year, Atlanta and its surrounding suburbs get a nice greenish-yellow blanket of dust. Unfortunately, you can’t eliminate pollen from landing on your car, unless you keep it locked away in a garage, so at some point, you’re going to have some of the green stuff on your vehicle. Waxing your car will actually help keep the pollen from sticking to your car as easily. 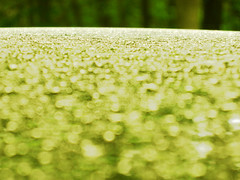 Pollen may not look abrasive, but wiping it off the car or even leaning on a pollen-coated fender can cause scratches. The best bet is to start with a freshly washed car, and apply a good coat of wax. Then, you can just rinse the pollen off weekly, or more often if you like. And by keeping it off the outside, less is likely to end up inside where it can coat the interior of your vehicle. As much as you want to enjoy the beautiful spring temperatures that come along with the pollen, keeping your car windows closed, whether you’re in it or its parked, will help keep the green stuff on the outside, especially in the early morning from 5:00am to 10:00am. Those are prime times for pollen. Also, set your air conditioner to recirculate when possible instead of bringing in air from outside. In a couple of weeks the Atlanta pollen shower should subside, letting people once again enjoy their convertible tops and windows. And remember, if your car needs a good cleaning or coat of wax, stop on by Towne Lake’s Carwash and Detail in Woodstock, GA or give us a call and we’ll shine it up and have you ready to cruise in no time.